Why Do Jewish Women Cover Their Heads? Do Women Still Wear Veils to Funerals? Actress Shauna Rappold wore a veil to a funeral for hurricane victims. 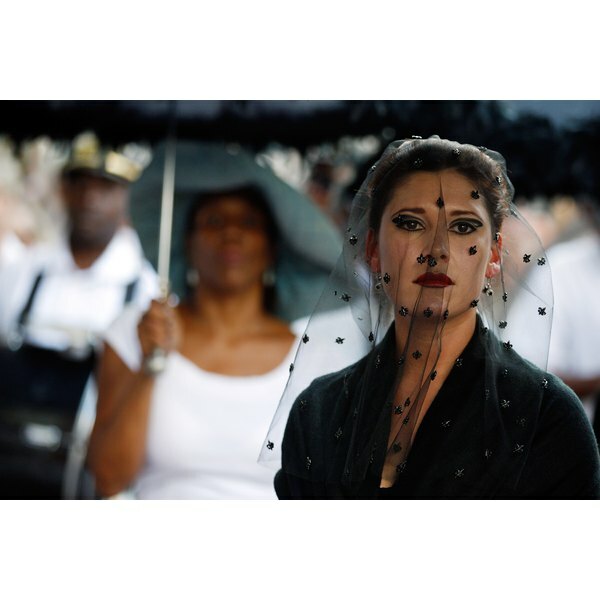 You may be familiar with the sight of a woman wearing a dark, lacy veil as a sign of mourning, such as the one actress Shauna Rappold donned to honor victims of Hurricane Katrina. The modern practice of women wearing black veils to funerals is in large part derived from the mourning traditions of the Victorian Era. Although the mourning veil is not as common as it once was, some women continue to wear it as a fashionable way to show their respect for the deceased. The Victorian Age, named after British Queen Victoria who reigned from 1837 to 1901, was a time of highly ornate fashion, architecture and interior design. Victorian mourning fashion featured full black attire, and for women, a black veil made of crepe. Bereaved women would even be expected to dress in black and wear a veil in public for an extended period of time after the funeral as a way of isolating the widow and other women closely related to her. The modern practice of wearing a veil to funerals has evolved drastically with the erosion of the strict social roles prescribed for women during the Victorian Era. Although it is a less common practice now, some women still wear a veil to the funeral of a husband or close boyfriend out of respect for tradition and as a sign of bereavement. Even though the Victorian tradition has faded somewhat, women from many other cultures continue to don veils out of custom. In a compilation of essays called "The Veil: Women Writers on Its History, Lore, and Politics," edited by Jennifer Heath, you can see that the veil continues to be a powerful symbol not just for women in mourning, but in other aspects of daily life as well. With the Victorian mourning attire largely a thing of the past, women today have a choice to follow traditional customs or go without a veil. Modern funeral attendees recognize there are many ways to express grief and deciding whether to wear a veil is a personal decision.